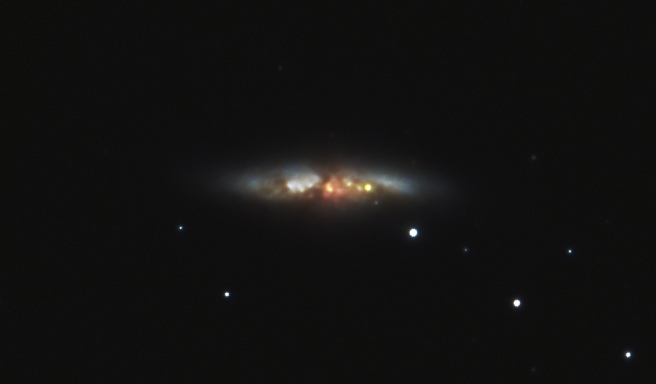 This is an image of the recent supernova in M82. Both the before and after images were processed similarly although the before shot is from a much deeper exposure. The after shot was taken on a night of rather poor seeing and with gusty winds. The wind ruined all but seven of the two minute subs so it is not a very deep exposure. Mouse over to blink the two images. Processing This image was processed entirely in Images Plus. Calibration, stacking and masked arcsine stretch in Images Plus . Masked noise reduction , sharpening and contrast enhancement applied in Images plus. Image binned and cropped.